I took a moment to contemplate this information. We don’t actually see very many snakes around here anymore. I probably see a lot more of them than anybody else in the house, because I spend more time out in the yard – and mostly what I see is the flick of a tail skedaddling back under the fence into the ranches on the other side. And they’re almost never more than 1-2 feet long from tip of tongue to whip of tail. And then I looked out the front window and thought, Dang…you know what? She’s right. That’s a decent-sized snake right there. I’ll admit that for a moment, I hesitated. So even though I’m fairly sure I’d have a better chance at being struck by lightning twice in rapid succession while clutching a winning Super Lottery Ticket in one hand and tickets to Hamilton in the other than to walk outside and find an actual rattlesnake on my front porch – well, let’s just say it would be just my luck to confidently stomp outside to clear off a “gopher snake” and end up in the ER explaining over and over again how I’d managed to take a rattlesnake bite right on the nose. 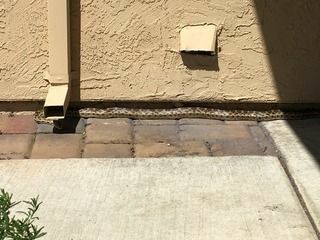 So I took my time and observed for a bit until I was 200% certain that what I had on my porch was in fact a gopher snake. And then I spent a few more moments pondering what I wanted to do about it. I mean, I couldn’t just leave him where he was – it’s a high-traffic area, with a lot of kids pounding to and fro all day and night. The last thing I wanted was for one of the precious little snowflakes to go fleeing home screaming about a “huge” snake, summoning their fathers out with shovels or what-have-you to “dispose” of it. But at the same time, I didn’t want to really scare him off. Basically, what I wanted to do was shoo him in the direction of the back yard – because given my preference, I really would like him to stick around. They eat gophers, y’all. And mice, rats, pigeons, squirrels – just about all the various varmints that like to get into my garden and destroy every last thing growing in it. And a snake that size? Yeah. He’s a friend. So I got my trusty broom, went out onto the porch, stood well back from his business end and started sweeping a few inches behind his tail. 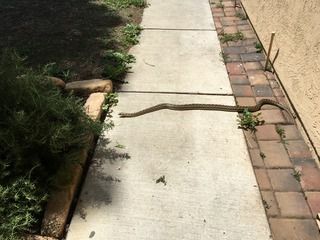 Snakes can be remarkably delicate, actually – what we consider a “gentle nudge” can really hurt them, so I didn’t want to, you know, actually nudge him with the broom. He did not like this. 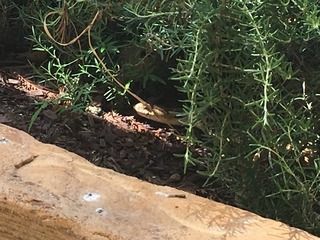 He gave me a warning hiss (have you ever heard a gopher snake hiss? it is impressively loud), and pulled back like he was going to take a big old bite out of that broom. …aaaaaaand he pushed on over to sulk in the rosemary bushes for a little bit while I went back inside and we all peered at him through the window. Once he was sure the coast was clear, he casually made his way along the front of the house and zip! under the fence into the backyard.